Skip the line to Top of the Rock Observation Deck at Rockefeller Center and take in the unforgettable views over New York City. It's one of those things you just have to try when visiting The Big Apple. With prebooked tickets you can save time and skip the line at the box office! Take in the amazing sights of New York City and beyond with this stunning 360° panoramic view 70 stories up in the sky. The experience starts on the ground floor where you will find a mezzanine with a dazzling Swarovski crystal chandelier and a multi-media exhibit full of the rich history, architecture and art of Rockefeller Center. Jump on board one of the glass ceiling sky shuttles for an exciting ride to the top, where you will find three stories of spectacular views, including stunning, open air outdoor decks. Shortly after your booking is complete, you will receive an e-ticket by email. Please print out your ticket and bring it with you to Rockefeller Center. You bring your e-ticket to the box office inside Rockefeller Center, where you exchange it for a ticket for the next available time. You can also choose to exchange your ticket for a different date and time, and when you come back you'll step into an elevator and skip the lines entirely. Available times may be limited. Where is the entrance to Rockefeller Center? The entrance is located on 50th street between 5th and 6th avenues. The entrance is marked by a red carpet. 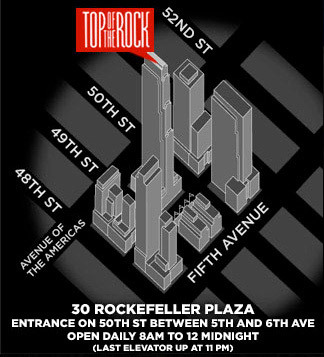 When can I visit Top of the Rock? Top of the Rock Observation Deck is open daily from 8 AM to midnight. The last elevator goes up at 11 PM. Your tickets are valid one month from the booking date stated on your e-ticket. - Due to security we strongly recommend you do not bring any large bags or suitcases. Yes, children's tickets are available for children between ages 6 to 12. Children under age 6 are free when accompanied by a paying adult. Every day 08:00AM to 12:00PM. Last elevator is 11:00PM. Reduced opening hours at Christmas and New Year!